魏宪芸, 顾静, 张名全, 秦智杰, 迪丽娜尔·艾尼瓦尔, 龚小玲. 上海市江心水库鲢、鳙年龄结构及生长特性[J]. 上海海洋大学学报, 2019, 28(1): 49-57. WEI Xianyun, GU Jing, ZHANG Mingquan, QIN Zhijie, DILINAER Ainiwaer, GONG Xiaoling. 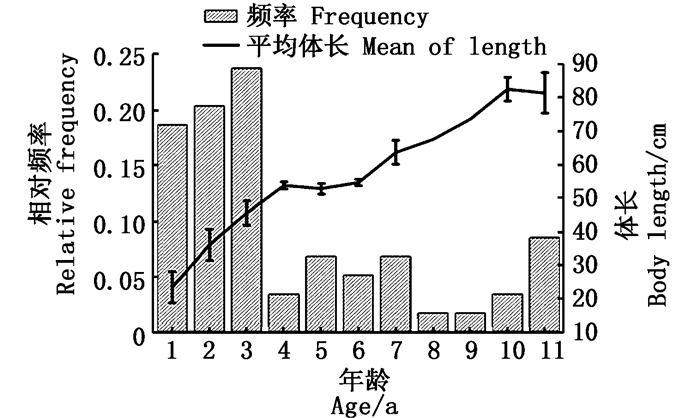 Age structure and growth of silver carp and bighead carp in Qingcaosha Reservoir in Shanghai[J]. Journal of Shanghai Ocean University, 2019, 28(1): 49-57. 王少坤, 王绍祥, 顾静, 等. 上海饮用水源地青草沙水库轮虫群落结构的特征及其环境影响因子[J]. 动物学杂志, 2017, 52(6): 1023-1036. WANG S K, WANG S X, GU J, et al. 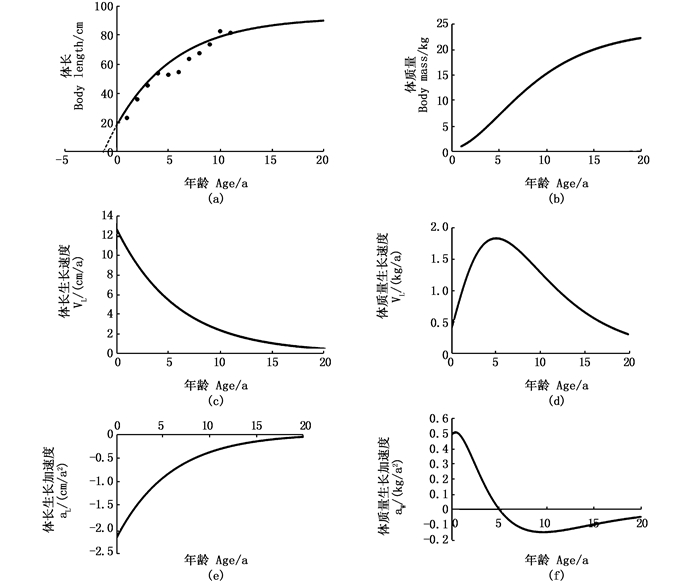 The characteristics of community structure of rotifer and its environmental factors in Qingcaosha Reservoir, Shanghai[J]. Chinese Journal of Zoology, 2017, 52(6): 1023-1036. 陆晓如. 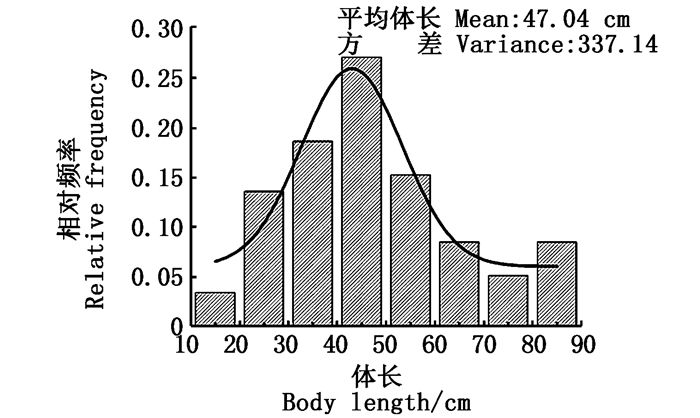 特大型水库综合运行调度平台建设研究与实践[J]. 净水技术, 2014, 33(3): 111-114. 胡忠军, 吴昊, 陈立侨, 等. 长江口青草沙水库正式供水前的鱼类群落结构特征[J]. 水产学报, 2012, 36(8): 1234-1241. HU Z J, WU H, CHEN L Q, et al. Structure of fish assemblages before drinking-water supplies in Qingcaosha Reservoir of Yangtze River Estuary[J]. 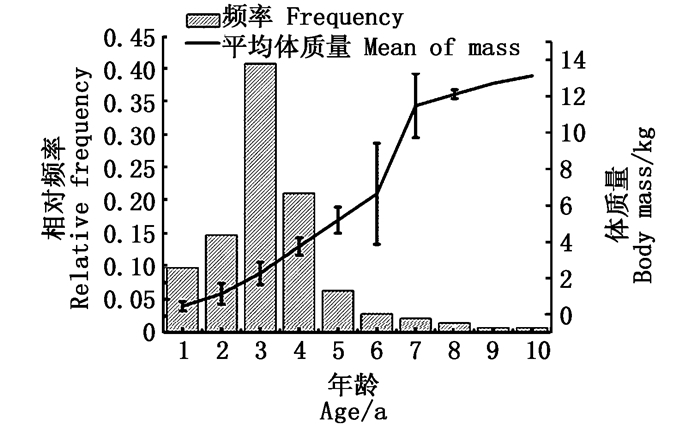 Journal of Fisheries of China, 2012, 36(8): 1234-1241. GAO Z J. 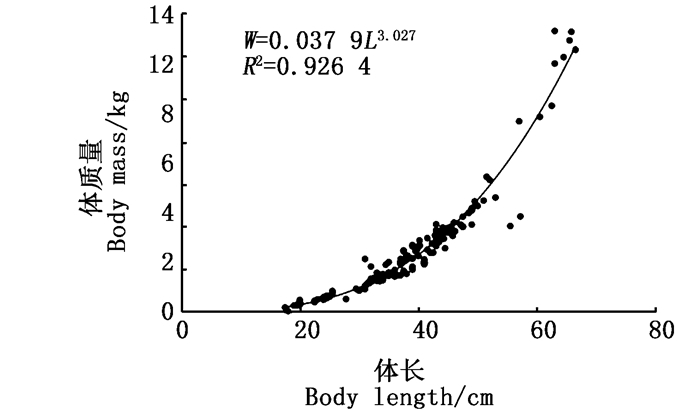 The growth and ecological effects of silver carp and bighead carp in Xiquanyan reservoir[D]. Harbin: Northeast Forestry University, 2012. 段金荣, 张宪中, 刘凯, 等. 鲢鳙鱼和藻类治理关系的初步研究[J]. 中国农学通报, 2009, 25(20): 327-330. DUAN J R, ZHANG X Z, LIU K, et al. 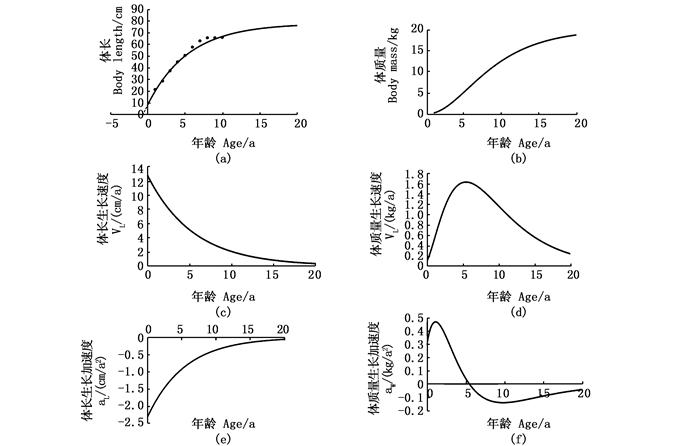 The preliminary study on the ralation between carp fish and algae[J]. Chinese Agricultural Science Bulletin, 2009, 25(20): 327-330. 张学健, 程家骅. 鱼类年龄鉴定研究概况[J]. 海洋渔业, 2009, 31(1): 92-99. 李强, 胡继飞, 蓝昭军, 等. 利用鱼类钙化组织鉴定年龄的方法[J]. 生物学教学, 2010, 35(6): 51-52. NEGI R K, MAURYA A. Length-weight relationship and condition factor of Labeo rohita and Hypophthalmichthys molitrix[J]. Research Journal of Pharmaceutical, Biological & Chemical Sciences, 2015, 6(2): 1505-1509. 杨景峰, 申玉春, 祁宝霞, 等. 孟家段水库鲢、鳙鱼生长规律的研究[J]. 内蒙古民族大学学报(自然科学版), 2002, 17(3): 277-280. 刘明, 王仁曾. 基于t检验的逐步回归的改进[J]. 统计与决策, 2012(6): 16-19. LIU M, WANG R Z. Stepwise regression improvement based on t test[J]. Statistics and Decision, 2012(6): 16-19. 靳庭良, 张宝青. 回归分析中t检验与F检验关系的进一步探讨[J]. 统计与决策, 2009(21): 7-9. JIN T L, ZHANG B Q. Further discussion on the relationship between t test and F test in regression analysis[J]. Statistics and Decision, 2009(21): 7-9. 熊飞, 陈大庆, 刘绍平, 等. 青海湖裸鲤不同年龄鉴定材料的年轮特征[J]. 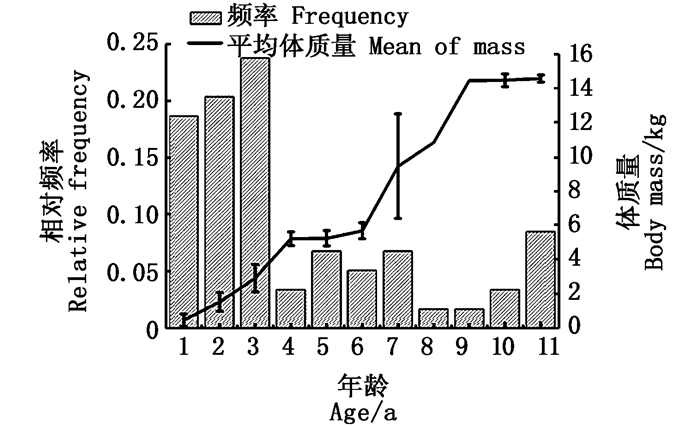 水生生物学报, 2006, 30(2): 185-191. ZHANG G D. Study on the eutrophication of the plateau reservoir by using the carp, bighead and aquatic plants[D]. Qingdao: Qingdao University of Technology, 2011. 朱峰跃, 刘家寿, 李钟杰, 等. 傀儡湖鲢、鳙的生长特性及渔业利用[J]. 淡水渔业, 2013, 43(2): 32-35. 殷名称. 鱼类生态学[M]. 北京: 中国农业出版社, 1995. YIN M C. Fish ecology[M]. Beijing: China Agricultural Press, 1995. 李思发, 王瑞霞. 长江、珠江水系鲢、镛的性成熟速度及其遗传分析[J]. 水产学报, 1990, 14(3): 189-197. LI S F, WANG R X. 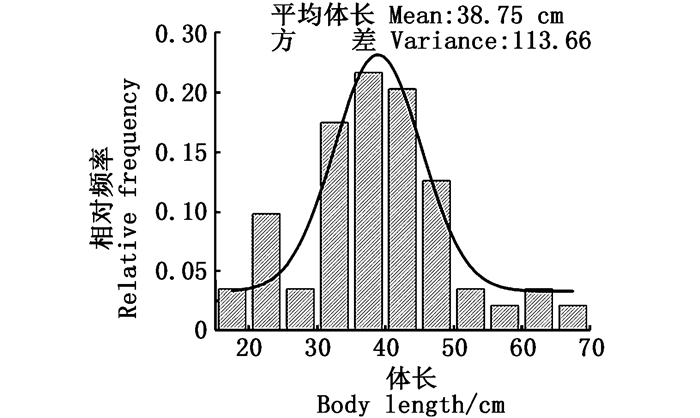 Maturity speed and genetic analysis of silver carp and bighead from Changjiang and Zhujiang River systems[J]. 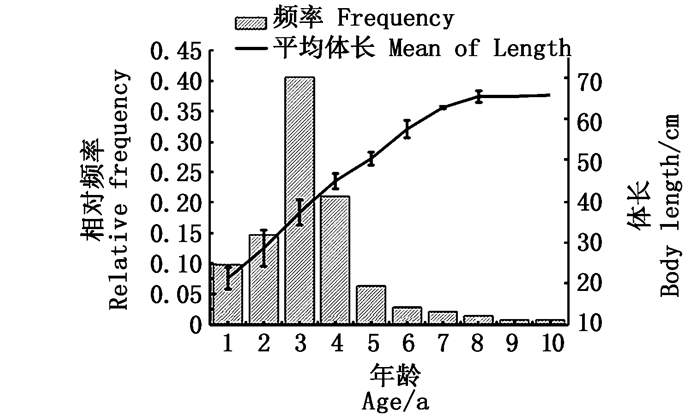 Journal of Fisheries of China, 1990, 14(3): 189-197. Abstract: The Qingcaosha reservoir in the Yangtze River estuary is a special system for water supply and the water quality is mainly controlled through biological manipulation methods by Hypophthalmichthys molitrix(H.molitrix) and Hypophthalmichthys nobilis(H.nobilis). A total of 139 tails of H.molitrix and 59 H.nobilis were collected from June 2015 to May 2017. Their ages were identified through the scales or vertebrae, and their growth characteristics were studied based on ages. The results showed that:the age of H.molitrix ranged from 1 to 10 years old and most of them ranged from 3 to 4 years old; The age of H.nobilis was composed of 1 to 11 years old, most of them were 2 or 3 years old. 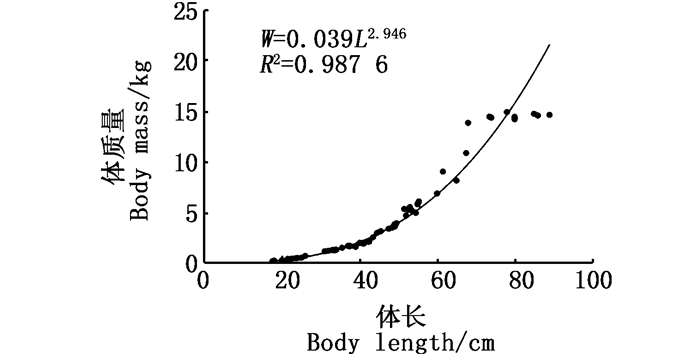 The formula of body length and weight of H.molitrix and H.nobilis were W=0.037 9L3.027 and W=0.039 0L2.946 respectively. the functions of Von Bertalanffy in H.molitrix was Lt=77.73[1-e-0.183(t+0.60)], Wt=20 024.3[1-e-0.183(t+0.60)]3.027, and that in H.nobilis were:Lt=92.11[1-e-0.172(t+1.27)], Wt=23 875.2[1-e-0.172(t+1.27)]2.946, the growth inflection points of H.molitrix and H.nobilis were 5.24 and 5 years old respectively. So it is recommended that the fishing age of H.nobilis and H.molitrix should be 5.5 years old respectively.